Classical Strings made our wedding ceremony so special, the music was incredible!" 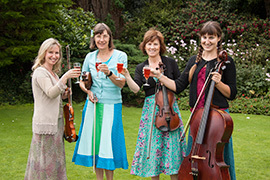 Classical Strings perform regularly at music festivals, including the Port Eliot Festival, the Great Estate Festival, and Porthleven Food and Drink Festival. The String Quartet perform timeless uplifting classics, through to Sue’s original arrangements of pop, rock and film soundtracks. Music from musicals, funky folk tunes and cool jazz are all part of our set! The Classical Strings Trio comprises of two violins and a cello, and is slightly more compact than the Quartet, so if space is a problem, but you would like more sound than a solo or duo, then this option is ideal. Featuring the violin and cello, this combination is ideal for performing in a small space. The violin melodies are supported by the depth of the cello sound and creates a well balanced performance. From romantic classics, upbeat folk and haunting celtic themes, the gentle melodic sounds of a solo violin lends itself well to small intimate gatherings of people, especially if the venue is a small room. 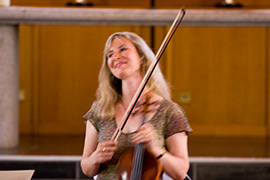 Classical Strings are led by professional violinist and composer Sue Aston, who has worked with some of the world’s top musicians from the classical, folk and pop world. Her music videos have been broadcast on Classic FM and Sky TV, and have received over 1 million views on YouTube. 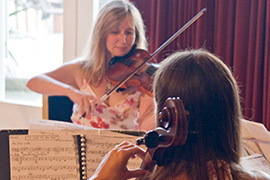 Choose from solo violin, duo, trio or a full string quartet to perform a wide range of musical styles for your wedding. From popular classics, through to Celtic melodies, rock ballads, light jazz and film soundtracks. If you have a favourite piece of music which you would like to be played on your special day, we can arrange it especially for you. We have recently arranged music by Adele, Jason Mraz, Charlene Soraia, Akon, Abba and film music such as Star Wars and Jurassic Park! Just perfect. Sue and becky played for our daughters wedding at Lowerbarns. These ladies made such a massive difference to the atmosphere. It certainly opened other guest's opinion to string music. Amazing and thank you . Amazing trio of Ladies that are hugely talented and experienced musicians. A delight to listen to and great for any type of event, but superb for your wedding. These ladies were AMAZING! Not only were they incredibally accommodating with my music choice which made that aspect of planning pretty easy and stress free but they made the ambiance of the ceremony and drinks afterwards. They did such an amazing job on old classics and new pieces that they were complimented by pretty much every guest. In fact the only time I came close to crying at my wedding was when the began playing our song. Couldn’t recommend them more! Classical strings made our wedding ceremony perfect, they sounded beautiful and were really friendly when asking questions about their repertoire. Would definitely recommend them to anyone who would like something different at their wedding, thank you Classical Strings for everything. 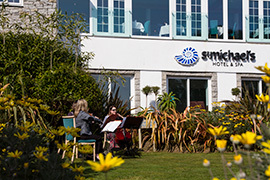 We hired Classical Strings to perform at our wedding at Watergate Bay in June 2017. I can honestly say that they were absolutely fantastic and one of the highlights of my day! The atmosphere created by the string trio as we walked into our ceremony was incredible. They are great musicians and really took our wedding to the next level. I can't recommend Classical Strings enough - thank you all so much for making our day even more special. I will always remember the first time I witnessed Sue perform her music. It was a captivating piece called ‘The Home Coming’, executed with colourful dexterity to the backdrop of the turquoise waves as they splashed majestically across the enigmatic Logan Rock to the buttery shore of Porthcurno. Enraptured by the sound of her violin an opportunity presented itself in 2016 to hear those haunting strings again. I’d planned a wedding proposal on the enchanting cliffs of Land’s End and Sue provided the perfect soundtrack to this magical moment. Onlookers stood open mouthed as her violin skilfully serenaded my beau and I. The playing was shining and powerful taking us both on a journey that couldn’t end in any other word than “yes”. “Yes….. yes ….yes. The sands of time will never take these memories from me. Thank you Sue. In April, I had the pleasure of performing with Classical Strings after my friend asked me to sing at her wedding at The Alverton. From our initial meeting where we discussed the programme to the big day, the quartet were professional, flexible, reliable and most importantly approachable. Their performance on the day was stunning, with genres ranging from classical to pop. Sue also composed a lovely arrangement of ‘Can You Feel The Love Tonight’ from The Lion King for soprano and strings, which along with the rest of the programme was played with great sensitivity – a real treat for the bride and groom during the signing of the register. The quartet were a joy to work with and I know that the bride, groom and their guests enjoyed their performance. I hope to work with them again and would recommend them to any couple looking to add a touch of musical class to their wedding day. I am a wedding planner in Cornwall and often recommend Classical Strings to my clients that are looking for this style of musicians. Classical Strings give a 5 star service every time and I really enjoy working with them. Not only are they extremely talented, they are professional, organised and lovely to be around. All of my clients have been over the moon with their service for our weddings and events. I highly recommend them. Copyright © 2019 Classical Strings | Website by Genius Loci. All rights reserved.